AMIMOTO Review 2019: Is AMIMOTO a Good Hosting? AMIMOTO offers managed WordPress hosting through Amazon Web Services (AWS). E-commerce merchants and large websites willing to pay above average costs for excellent functionality and capacities will find a home here. AMIMOTO is a Japan-based web hosting company founded in 2006. It specializes in offering services through the Amazon Web Services (AWS) network, leveraging on Amazon’s global reach to offer premium fully-managed or self-managed hosting solutions to its clients. The company’s clients include brands such as VISA, Sharp, and Mazda. Support is available in both English and Japanese. AMIMOTO primarily offers managed WordPress hosting solutions through AWS. All plans come with a 99.99% uptime guarantee and access to the AWS Content Delivery Network (CDN). E-commerce merchants can benefit from a free SSL certificate with every plan and servers with worldwide geographic proximity. AMIMOTO also provides access to Softaculous via AWS, which gives you one-click installations for hundreds of extensions including Joomla and PrestaShop. Unfortunately, no free domain registration is offered. All plans are run via the AWS control panel. 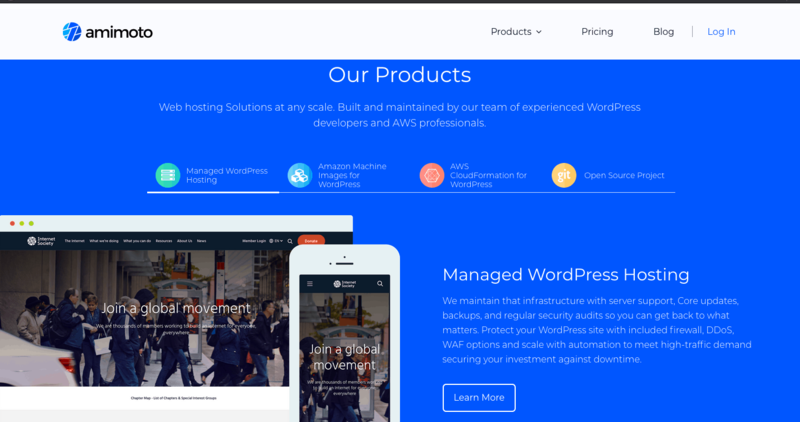 There are also WordPress-specific features offered including WP-CLI to help you manage your website(s), staging environments for secure testing and deployment, expert WordPress support, and more. In addition, remote access is available via SSH. Backups are performed daily and data is retained for three days. For advanced webmasters, RAM/storage can be scaled automatically, and support is offered for the Ruby and Apache programming languages. Discounts are available on yearly plans and there is a seven-day money back guarantee on self-hosted plans. Unfortunately, there are no money back guarantees offered on the managed WordPress hosting plans. There are ten managed WordPress hosting plans offered. CPU and memory is handled through AWS, and storage capacities on the CDN range from 50GB-5TB. Unlimited website traffic comes with all plans. Entry-level prices are high relative to competitors. However, that’s because the amount of value you get with AMIMOTO’s feature list is great. Beginner webmasters won’t need all the features and capacity provided, but any good-sized website or e-commerce store can find what it needs here. The quality of the price to value ratio as you move up the pricing tiers depends on your needs. The only capacity difference is the available CDN usage, which increases at a modest 1:1 price to volume average. The bigger value comes from increased network performance and WordPress installations allowed for minimal costs — an excellent value for webmasters running a large network of websites. Support options are average. There’s a live chat option, but it’s not 24/7. However, if you connect when no representative is available, you can send an email with your question. As you can see below, I sent an email this way and got a response within seven hours. Ticket support and a self-help knowledge base of over 100 questions is also available. Unfortunately, there is no phone support. For an additional fee, AMIMOTO also offers expert support plans to help you with e-commerce services, maintenance, security audits, and more. AMIMOTO offers managed WordPress services using AWS with an excellent 99.99% uptime guarantee, free SSL certificates, and Softaculous. Webmasters running a large network of websites or e-commerce portals willing to pay for the power and scalability will get the most value for their money. Beginning webmasters who don’t need so much power can find cheaper alternatives. Wondering how AMIMOTO stacks up against other Web Hosting companies? Enter any other Web Hosting company and we will give you a side-by-side comparison.